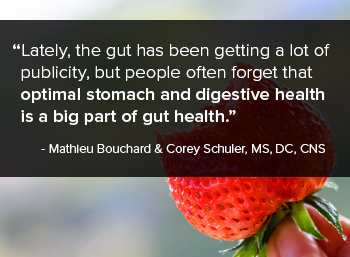 Lately, the gut has been getting a lot of publicity, but many people often forget that optimal stomach and digestive health are a big part of gut health. Learn more about how to protect digestive health and stomach’s barrier here. After being masticated, food travels down the esophagus to arrive in the stomach for the next step in the digestive process. This mainly involves the gastric juice that contains hydrochloric acid (HCl), which will serve to denature dietary proteins, activate pepsinogen into pepsin, and sterilize stomach content. Pepsin, the main gastric enzyme, breaks down dietary proteins into peptides and amino acids. The stomach is the first step in digestion of proteins, contrary to the digestion of carbohydrates and lipids which start in the mouth. It will also produce gastric lipase to partially digest lipids and mucus to help protect the stomach lining from its own acid. The main problems encountered in the stomach are gastric acid production and mucus production. Low stomach acid is a common issue among many people and belching, indigestion, gas, and bloating shortly after meals can occur. Chew food thoroughly. Mastication is the first part of digestion and helps regulate stomach’s gastric juice production. When you eat, eat. Don’t try and do multiple tasks while eating, as this may impair digestion. Listen to your body. Some food may cause more bloating and belching that may not be optimal for health. Eat smaller meals and avoid eating large meals too often. 2. Esplugues JV, Barrachina MD, Beltrán B, et al. Inhibition of gastric acid secretion by stress: A protective reflex mediated by cerebral nitric oxide. Proceedings of the National Academy of Sciences of the United States of America. 1996;93(25):14839-44. 3. Bresnick WH, Rask-Madsen C, Hogan DL, Koss MA, Isenberg JI. The effect of acute emotional stress on gastric acid secretion in normal subjects and duodenal ulcer patients. J Clin Gastroenterol. 1993 Sep;17(2):117-22. 4. Konturek PC, Brzozowski T, Konturek SJ. Stress and the gut: pathophysiology, clinical consequences, diagnostic approach and treatment options. J Physiol Pharmacol. 2011 Dec;62(6):591-9. 5. Goodwin RD, Talley NJ, Hotopf M, et al. A link between physician-diagnosed ulcer and anxiety disorders among adults. Ann Epidemiol. 2013 Apr;23(4):189-92. 6. Hsu YC, Hsu CC, Chang KH, et al. Increased Subsequent Risk of Peptic Ulcer Diseases in Patients With Bipolar Disorders. Medicine (Baltimore). 2015 Jul;94(29):e1203. 7. Scott KM, Alonso J, de Jonge P, et al. Associations between DSM-IV mental disorders and onset of self-reported peptic ulcer in the World Mental Health Surveys. J Psychosom Res. 2013 Aug;75(2):121-7. 8. Matsui H, Shimokawa O, Kaneko T, et al. The pathophysiology of non-steroidal anti-inflammatory drug (NSAID)-induced mucosal injuries in stomach and small intestine. Journal of Clinical Biochemistry and Nutrition. 2011;48(2):107-111.
doesn't the stomach digest itself? Physiol Rev. 2008 Oct;88(4):1547-65. 10. Lakhan SE, Kirchgessner A. Gut inflammation in chronic fatigue syndrome. Nutr Metab (Lond). 2010; 7: 79. 11. Mawdsley JE, Rampton DS Psychological stress in IBD: new insights into pathogenic and therapeutic implications. Gut. 2005 Oct; 54(10): 1481–91.